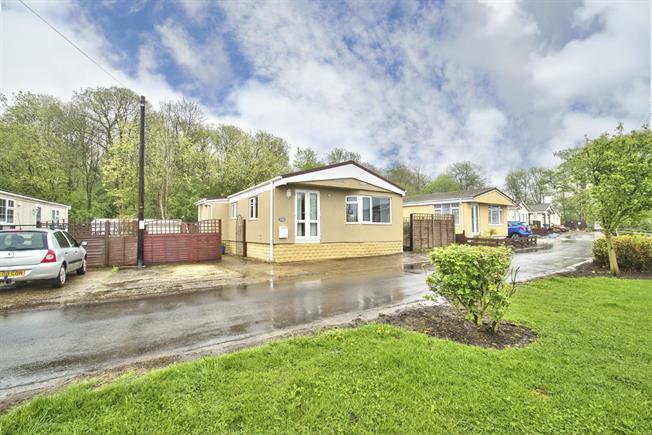 3 Bedroom Mobile Home For Sale in Huntingdon for Asking Price £125,000. Taylors Estate Agents are pleased to offer a deceptively spacious three bedroom park home, located within this popular retirement park. Internal accommodation comprises; entrance porch and hall, three bedrooms, kitchen and lounge/diner. Outside the property boasts a generous wrap around plot with woodland views to the rear and off road parking to the side. UPVC door leading into entrance hall, uPVC window to side aspect. Double glazed uPVC window with frosted glass facing the side overlooking the garden. Radiator, vinyl flooring, built-in storage cupboard, tiled walls. Low level WC, corner shower, vanity unit. Double glazed uPVC window facing the side. Radiator, vinyl flooring, part tiled walls. Roll top work surface, wall and base units, one and a half bowl sink with mixer tap and drainer, space for cooker and overhead extractor. Space for fridge freezer, washing machine and dryer. UPVC patio double glazed door, opening onto the front garden. Double glazed uPVC windows facing the front and side. Radiator and feature fireplace. Wrap around plot, mainly laid to patio and enclosed by timber panel fencing. Woodland views to the rear and driveway for two vehicles to the side.